So tell me Ralf, what is The Barn and how did everything begin? Ralf: The Barn is a specialty coffee roastery, but four years ago we started as a specialty coffee shop. It was me baking cakes and another barista (who now has a coffee shop in Berlin) teaching me how to make coffee. I didn’t have much knowledge at that time, but I was a drinker. The concept was to serve the best coffee, the best cakes and the best sandwiches. So it was bread, cake and coffee. We pretty quickly connected internationally to the specialty coffee movement, which was developing a lot faster in other countries such as Norway or the UK. We worked really closely with amazing roasters, who helped us learn a lot about coffee. London had a very strong influence on us, we quickly became friends with James Hoffmann (Square Mile Coffee Roasters), Tim Styles (Workshop Coffee Co.). They helped us a lot in the beginning, because we couldn’t find any coffee we like here in Germany. There were a lot of roasters and a lot of good people, but we were looking for something very specific. It had to be traceable, sustainable, highest quality, we wanted to know what coffee is in the blend and it was really hard to get this information. Then we couldn’t get it the style we wanted – we prefer lighter roasted Nordic style coffee. We prefer tasting the coffee instead of its roast. We wanted to learn from the best people and they were in other countries. They had more time to develop and in Berlin it was pretty new. So after one year running the shop we knew we wanted to roast ourselves. What about now? What did change in these four years? Ralf: Now our team consists of 15 people. It’s pretty tight but we work very efficiently. We are all very enthusiastic people that come mostly from other countries, because in Germany the specialty coffee culture is not so popular yet. We do a lot of talking and teaching, that’s why we have also built this long brew bar here in the roastery. Because when people see it, they become interested in it. In Germany there’s still a lot of work to do in terms of teaching, like in many other countries, but we can also see that in the last four years people around us and in Berlin are being a lot more informed. More shops popped up that are caring about coffee and the customer is becoming more aware of what coffee is. And so you can see that something’s going on. In the meantime our team is growing and we are all the time teaching and training people. Some of them are here for three years already. We are trying to develop their career, make it more interesting. They start baking cakes for example, they’re learning service, we train them for baristas and now we have started training people on the roasting side too, because it’s becoming a lot more. Since we started talking so much about people, tell me what do you do when it comes to hiring new staff members? Ralf: We actually have a lot of crossovers from customers onto the barista side. There is not really a training or apprenticeship that is offered, it’s more like you learn from good people, you start doing it and perfect the skills. It is very much driven by your own motivation and desire to become better and to learn more. As I said, we have many foreign people working with us and as much as we benefit from working with such, sometimes there are problems and they go back to their own country. What we try to do now is to bring back a German element to coffee, because we are based in Germany. We want to teach more so that the job becomes more appealing to Germans. And then hopefully we can build for them a longer career around coffee and roasting and people would like also to stay with us longer. Working here at The Barn is also a good opportunity to learn so I try to involve people in how to run a business. This enables them to start their own adventure. Then we can get more people opening shops, they will hopefully use our coffee and this way we can reach out to more people. 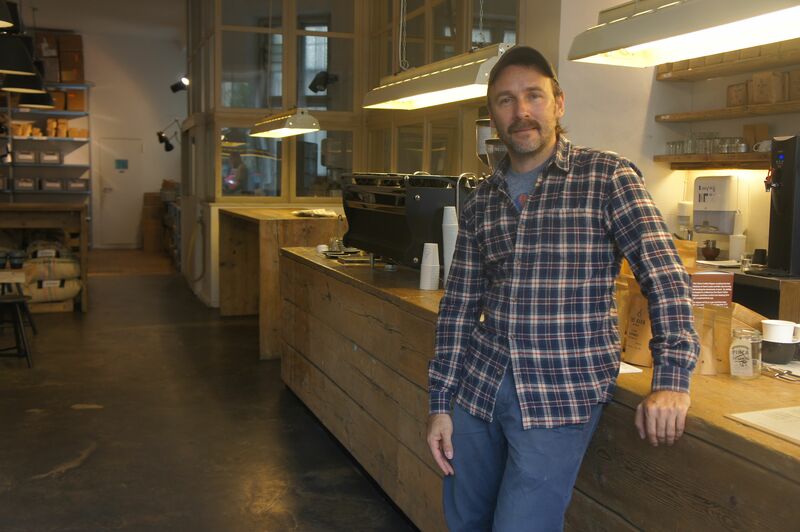 In Berlin there are still many areas where you don’t find specialty coffee. This is the largest German city and there are not so many specialty shops for three and a half million people. There’s a lot of potential. Tell me about The Barn’s philosophy. Ralf: It is really easy to go simple and fulfill every customer’s wish, and we don’t do that. But you have to learn how to say it nicely. We also learned a lot over the years, it is really important to have some people who are really staying strong to hold the line. You need to have a clear vision of the business and you need to be very clear who you are, so people understand you. I think with this venue here, the big roastery, we wanted to create a very slick and reduced brew bar which is like the extention of the roastery, our manufacturing space. So it was easier for us to say, look we don’t have everything, we only have the best and want you to taste it. Humans are usually going the easiest way and if we don’t implement strict protocol then we would be hiring new people and new people, everything would go easy and suddenly we lose our identity. It’s about keeping the standards and making everyone who’s working with you understand them and stand firmly behind them. We discovered that the language is a bit problematic for both sides. It makes our baristas uncomfortable if they can’t communicate in German and the customers also. They don’t want to admit if their English is not so good, so they feel awkward, say ok to everything they get something they don’t really like and then they are not coming back. So we need to break down this barrier and then it would be really easy for us to communicate with people. Also we try to make it clear that we’re very fond of specialization and don’t want to please every customer’s wish. It’s very important to be proud of what you’re doing, in a nice way and you should only do what you like. Only then you can sell it. But you need to express yourself and you need to tell them who you are. And I think an easy way to do that is to be just different. When you enter The Barn you see we don’t have the menu on the wall to confuse everybody. We also don’t have a latte or a cappuccino, we only talk about the espresso and the milk quantities. It comes to personal preferences that’s why we like to engage with the customer more. We usually ask people when they walk in and they’re new if they would like black coffee or with milk. Because all our filters we only serve black, so we need to ask in the beginning. If you don’t do that it’s always hard when people get their coffee and ask where the milk is. What we do in cases like these is usually we make the customer an espresso beverage instead of the filter, because it’s our mistake to serve something he/she doesn’t like. In our filter coffees we really want to taste the purity, origin, taste notes and if you mix it with milk you don’t get so much of that. Some coffees work with milk, but some actually don’t. I think specialization as well as to have standards are key but also to lower the barrier. What makes The Barn coffee different? What’s so special about it? Ralf:We are the other end of the spectrum on which convenience is. Coffee in capsules is very convenient – you take one, you put it in the machine and it always tastes the same. If you want something else you just buy another capsule. For some people this is really nice because they don’t have to think, it’s always consistent. We are the other end – we are connecting to the farmer, it’s really important for us to pay the farmer well, because they know how to grow coffee, but no one has been asking them for the past decades. They’ve been only asked “Can you do more?” and “Can you do cheaper?”. And now suddenly they connect to people like us and we ask them to do what they know. And we instead of these questions ask them to pick the cherries only when they’re ripe, so we can get more flavour in the cup. But then it is more expensive, because it gets slower, also we want them to dry slower to prevent the beans from cracking, so it is very labour intense. Then we are happy to pay double the price. Another thing that might be different from other roasteries is that we don’t blend any coffee. We always find beans which have all the elements to get a perfect cup – body, flavour, sweetness, acidity, balance. And then we don’t need to blend it with anything. We want to build relationships with these farmers, that’s why we encourage them to invest in their farms so the coffee quality goes up each year. When we start working with a farmer only 40% of the his/hers coffee is top quality, over the years it goes up to 80%. They are happy because they get more money and we are happy to pay them, because we get the quality we want. But how do you source the coffees? How do you actually find the farmers? Ralf: It’s a bit tricky because we are small, we are in Berlin and we are building our business right now. So what we do is we’ve built a really close alliance with people in other countries like Square Mile, Tim Wendelboe, Drop Coffee and then we share. And so some of us are flying to Kenia, some to Ethiopia, some to Costa Rica and find a coffee. We usually need one person in the country. There are also specialty traders like Nordic Approach, Café Imports, The Collaborative Source and they have many roasteries so they know what they need. They are buying big quantities from the farmers and then we can buy from them and pay a little bit extra. But that’s the most economical way for us to make sure that people really understand what we need. There are no multiple traders, it’s only one person in between. We try to go as direct as possible, but it is not always direct, because I also believe not every roaster should fly around. Then everybody would be on the plane and nobody roasting.